I didn't want to cook for a few days. That didn't seem like so much to ask. And so much of the appeal of staying at the Sebasco Harbor Resort was the MAP plan. For $45.00 a day, I could have a full breakfast and dinner without ever having to take out my wallet. This included lobster, brought in daily from right off the docks. It also included food for my young sons. While this wasn't a deal per se, it was at least something I could rationalize for a few days. Ultimately, I was pleased with the quality of food at Sebasco. The lobster, in fact, was the most memorable-tasting of the ocean, as fresh as could be. That being said, the homemade potato chips were irresistible, too. Sebasco has, essentially, two dining options The Pilot House, upstairs and the more casual Ledges, downstairs. We ate at the Pilot House for three different meals. We began our first night with dinner there. The space is lovely, but the experience was stressful as within minutes, my typically careful three year old tipped over twice in his chair! 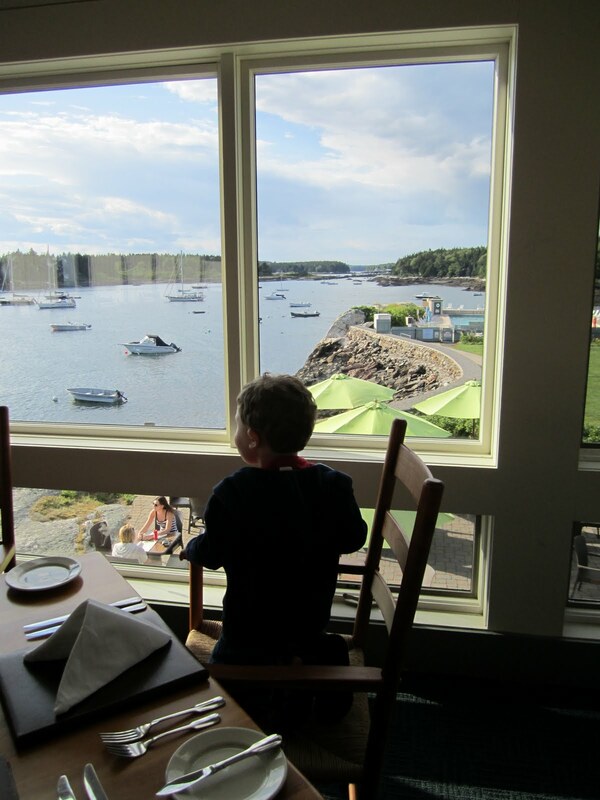 Needless to say, we moved him into a high chair, and though he wasn't too pleased, we were able to watch the birds fly over the harbor and enjoy our meal. 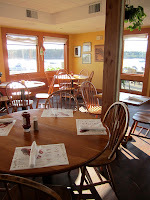 Our food, including fresh salads, hamburgers for the kids, salmon for my mom and lobster for me were very good. And the views were spectacular. We returned for breakfast. This time the boys had oatmeal and pancakes, while I had delicious granola and eggs. The only complaint this time? Service seemed a bit slow...meaning simply that we had to keep my hungry boys from whining too much. Brunch was the best, as it meant the food was there instantly. The quality and range was also good. My mother got fresh fruit and cereal, while the boys had waffles, bacon, eggs and cinnamon rolls. 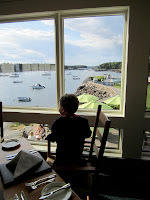 We felt far more relaxed, though, in the Ledges restaurant. Between the more boisterous atmosphere, the TV, the access to the outdoors and, quite frankly, the bathrooms, we were able to enjoy the food and the kids. Over the course of a few days, my sons enjoyed truly homemade mac and cheese, thin slices of white meat chicken tenders, fresh haddock in fish and chips and, of course, a hot dog. My mother and I tried the salads, the lobster roll and, of course, had more lobster. I loved, too, the micro-brewed draft beers, while my sons were delighted by their first experience eating whoopie pies. Our last day offered one last treat: a picnic brunch outside on the Ledges' lawn, featuring blueberry pancakes made as quickly as people gobbled them up. While, by that point, my mother and I needed another set of hands to ensure that the boys had, yes, all their beverages, maple syrup, fresh fruit and pancakes BEFORE we sat down, it was a pleasure to eat while we watched the birds, the sailboats and kayaks skim by. So, overall-the food was good. Did I appreciate not having to do the dishes for a few days? Absolutely. Was it as easy as I had hoped? No...I didn't realize the stress of two kids waiting for meals at a restaurant. Was the food decent? Absolutely. Would I have loved a bit more fresh fruit and veggies for the kids? Yes. But, truth be told even I couldn't resist those potato chips!